We’re almost halfway done with the Overwatch League’s inaugural season. 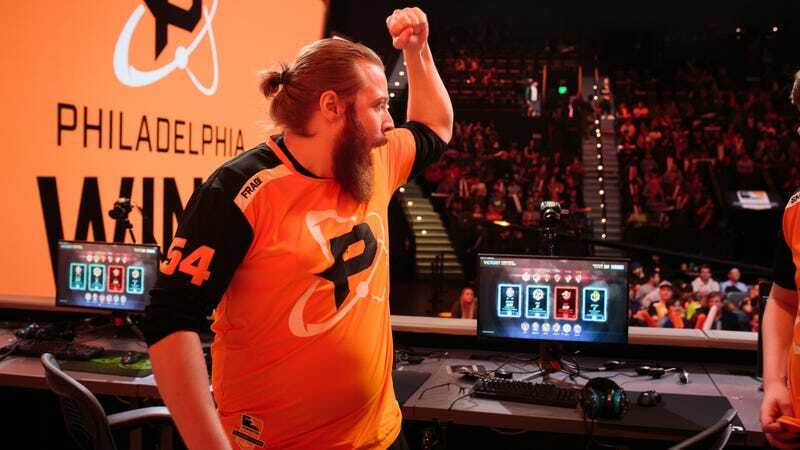 While this stage had its fair share of highs and lows, the real standouts for me are the two teams who will be vying for the third spot in the stage playoffs this weekend: the Philadelphia Fusion and the LA Gladiators. The Fusion got off to a frisky start, while the Gladiators had a sudden surge of life in week 3 with victories over the Valiant and the Spitfire. Both teams have had a big stage, and capping it all off with a playoff run against the still-reigning top 2 of New York and London will be exciting to watch. It all depends on the last match today, between the Gladiators and the Boston Uprising. If LA wins by three maps, they take the third-place spot; otherwise, Philly takes it. It’s a long road ahead for these teams, but thankfully the stage playoffs are on Sunday now, so it won’t be a long night. The London Spitfire and Dallas Fuel get things started at 4:00 p.m. ET, while the playoff-deciding match between Boston and LA should start around 8:00 p.m. ET. Once the top 3 is set, the two title matches for stage 2 will kick off tomorrow starting at 4:00 p.m. ET. All of this and more, over at the Overwatch League Twitch channel. Spring playoffs are underway in the League Championship Series. Team Vitality takes on H2K in the second quarterfinal match-up in Europe today at 12:00 p.m. ET, while North America will play its first quarterfinal between Team Liquid and Cloud9 at 5:00 p.m. ET. The playoff action continues tomorrow at approximately 3:00 p.m. ET with Team SoloMid and Clutch Gaming in North America. Follow it all on the Riot Games Twitch channel. The battle royale esports rage on at the PUBG Spring Invitational, where squads are dropping on islands and doing some mean things to each other. The cool part? If you watch on PGL’s site, you can see the feed for every team as well as the map and main feed. One step closer to our reality nightmare Hunger Games come to fruition, but I like the options. Follow the action and schedule over on the PGL site—it’s worth watching it there over Twitch for the multi-feed. This fighting game tournament with a kickass name is already underway. It’s a stop for both the Street Fighter V and Tekken 7 pro tours, and has tournaments for Dragon Ball FighterZ, King of Fighters XIV, and even Ultra Street Fighter IV. Hit the main stream here and follow the schedule and standings over on the Smash.gg page for the tournament. DreamLeague Season 9 is underway, a minor for the Dota pro circuit but still crucial for teams trying to tally up those circuit points for a ticket to Vancouver. Newbee and Fnatic are currently playing to face off against Team Liquid later today; the victor of that match takes on Team Secret in the grand finals tomorrow at 11:30 a.m. ET. This is the time of year when the Dota gets real good, so be sure to pop in to the DreamLeague Twitch channel to see what’s happenin’. Yup, there’s some virtual racing going down this weekend. The ForzaRC 2018 pre-season invitational starts at 12:00 p.m. ET, so if you want to check out some slick driving on a simulated track, you can find it on the ForzaRC site on their Mixer stream. Now that the Western and Eastern clashes are done for the Blizzard hero brawler, regular league play resumes this weekend. The games start at 5:00 p.m. ET with Team Freedom against Team Twelve and Tempo Storm going up against LFM Esports. Check that out over at the Blizz Heroes Twitch channel. More league play is underway in season 5 of the Rocket League championship series. North America starts the weekend’s matches at 3:00 p.m. ET when Ghost Gaming take on Rogue, while Europe will wait until 12:00 p.m. tomorrow to start their matches. Check out the high-flying rocket-car soccer action on the Rocket League Twitch channel. Full Bloom 4 is underway in Indiana, where Melee and Smash 4 tournaments will feature some top talent, especially for the former; Hungrybox, Leffen, Mang0, Axe, SFAT, ChuDat... it’s a Melee party. Follow the schedule and streams through the Smash.gg page, or check out the MeleeEveryday Twitch stream. For Smash 4 fans, you might also be interested in the Battle for Vegas, where top players like MkLeo, Nairo, Salem, and Larry Lurr will battle it out at the grand opening weekend of Esports Arena Las Vegas. Check the stream on Esports Arena’s Twitch channel, starting at 3 p.m. ET. Did we miss anything? Any tournaments you’re excited for? Got a favorite Overwatch squad for the coming stage 3? Let me know in the comments!